Martha Bradford had no intention of teaching music in Nigeria. When she and her husband, Rick, moved to Egbe in 2014, she thought God had other plans for them. But little by little the students came. Someone saw her playing the guitar and asked for lessons. As word spread, she increased to three students, then five. Whole church worship teams came asking for help. It was turning into more than a side project. Six months into teaching part-time, Martha had an epiphany: this is where God wanted her. She moved the makeshift studio out of her home and into a nearby office building. The students kept coming and Egbe Music Academy (EMA) was born. With a degree in keyboard and theory, Martha's 25 years of teaching were coming to fruition. Today she spends six days a week at the studio where four practice rooms accommodate the demand. Each day is different but Martha has one major theme. "From day one my goal was to teach people who could be teachers to others," Martha said. "I have a great passion for music," said EMA student Obafemi Balogun. "I saw Egbe Music Academy as an opportunity to learn more about music, especially the theory." Obafemi is learning ukulele, a novelty in Nigeria. Nigeria is full of talented people. But churches generally own musical instruments and few people have their own. To remedy this, Martha is always adding instruments to her inventory. On a recent trip home, she brought back two violins, two clarinets, a trumpet, trombone, banjo, saxophone, flute and several recorders. This joins her line-up of keyboards, drum set and guitars already in the studio. 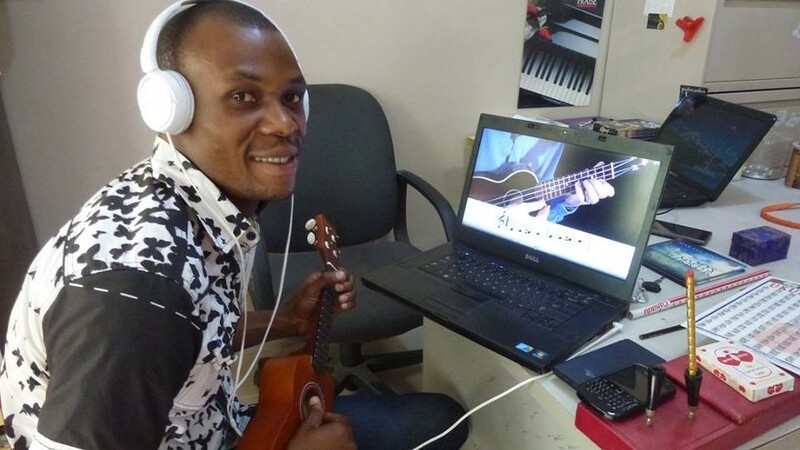 "Egbe Music Academy has helped me to develop my skills," Obafemi said. "I am in a talent contest right now and the school has helped me a lot through coaching me and making instruments available for me to practice, with the help of Martha." Regardless of ability, Martha always starts in the same place with new students. "People really need to learn rhythm, so I teach a lot of that before I teach pitch," Martha said. "I was trying to think of a way to get people to engage with the music school and take value in learning to read music because everyone plays by ear. People just do music but they don't record or transcribe the songs for the next generation." As students learn rhythm Martha moves into pitch, music notation, aural skills, harmony, theory and music history. Students can use any of the classrooms and instruments for free. She charges a small fee for the 10-week music courses and lessons. The most popular music book in Nigeria was first printed in 1903. Since then, hundreds of millions of copies of Ira Sangkey's Sacred Songs and Solos have been printed, containing traditional church music passed down through the decades. Unfortunately the book contains only lyrics and no music notation. As years go by, many tunes are being forgotten and the Nigerian Church stands to lose its historic music. With this in mind, Martha teaches some of the songs to her students and works with them to transcribe some of the hymns for future generations. While she is trying to preserve historic church music, Martha recognizes the global trend of modern worship music. Most of her students are young people and take their inspiration from the internet. With this reality, she grounds students in music history and theory while helping them worship in all genres, even incorporating traditional Nigerian instruments into the repertoire. In the academy, Music is often a tool for life lessons, from teaching discipline in mastering an instrument, to furthering students' theological understanding. When writing music Martha requires the students to understand the lyrics they compose. There are many opportunities for teachable moments. Recently they explored the word justification in worship songs and opened the Bible for rich examples of this theme. This year Martha had an idea to excite her students about written music. She organised an Easter music composition contest open to everyone in the community. There was one rule: song lyrics had to be written down and submitted in advance. The lyrics were evaluated for theological soundness and judged with the live performance in a public concert. In future contests, students will have to submit full music scores too. "I thought if people had to hand in their lyrics, it would make them think about what they believe, and they'd have to organize people and rehearse," Martha said. While only five students entered the competition, more than 150 attended the live concert. The winner, who took home a cash prize, was a choir member of a local ECWA church. The church meets on the campus of Egbe Hospital and is part of the ECWA denomination SIM missionaries helped to plant in Nigeria more than 60 years ago. Martha views the contest as a success, and hopes it becomes an annual tradition. As the school grows, Martha is looking for local music teachers to fill the need, acting more as an adviser to ensure the future of Nigerian worship music is firmly in the hands of the people.